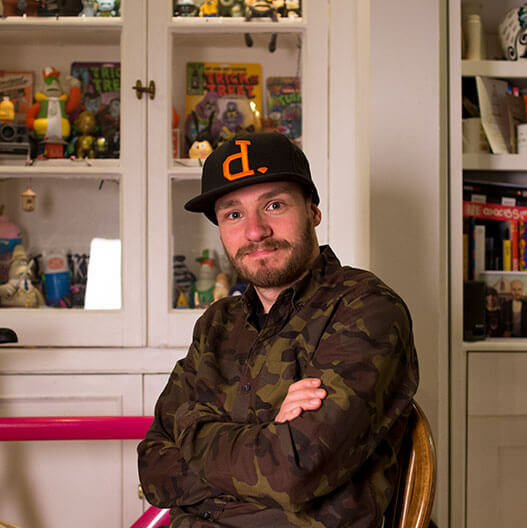 By Day, Gavin Strange is a Senior Designer for the Interactive arm of Aardman Animations, by night he’s a Designer & Director going under the alias of JamFactory, indulging in all manner of passion projects. In 2015 he wrote his first book ‘Do Fly’, published by The Do Book Company, and he co-founded the contemporary design store ‘STRANGE’ with his wife Jane. He lives in Bristol with Jane, his son Sullivan and their greyhound Peggy. It’s my pleasure to introduce Gavin Strange to the Everyday designer interview corner. Welcome Gavin and thanks for taking the time out for this interview. If you would, please could you give us a little introduction to yourself and what you do for a living? Ahh thanks ever so much, thank you for having me! My name is Gavin Strange and I’m a 34-year-old human man living and working right here in Bristol. I live here with my wife Jane, my son Sullivan and our greyhound Peggy. By day I’m a Senior Designer for the Interactive arm of Aardman Animations, and by night I go under the alias of ‘JamFactory’ as a Designer & Director, indulging my passion for all manner of passion projects! I’m also the co-founder of contemporary design store ‘STRANGE’ with my wife and last year I wrote my first book ‘Do Fly’, published by The Do Book Company. First off Gavin, congratulations on the birth of your son Sully. How are you enjoying fatherhood so far? Thanks so much man! I LOVE Fatherhood, it’s so much fun and just feels so right. It really took me by surprise how parenthood just felt so natural for us both. That’s not to say we found it easy, not at all, but more just how ready and willing we were for all it’s challenges. It comes with the greatest reward ever though, as the second your own tiny baby human that you created smiles at you – you just melt and everything else in the world fades away. It’s lovely! Great to hear. So you’ve been at Aardman Animations for over 8 years now. How has your role changed since you’ve there? And more importantly, have Wallace and Gromit shared any of their cheeses with you over the years? I have, we’re close to 9 years now! Technically I was there for 6 months as a freelancer, to begin with, but on 1st July it’ll be my 9 year anniversary as a full-timer. Ha! Funny you should say that we have all received a wheel of Wensleydale cheese or two over the years, especially at Christmas, so yeah, Wallace & Gromit HAVE shared their cheese with us! I’ve had the same role for the whole time, I’ve always been a Senior Designer for the Interactive team (which used to be called Digital, which used to be called Online!) – but, my opportunities over the years have opened up greatly. I’ve been lucky enough to provide graphic design for the Shaun the Sheep Movie, to illustrate and paint gigantic 5 feet tall versions of Gromit and Shaun. I’ve even directed a couple of pieces of moving image for the studio too (the OFFF titles, co-directed with studio stalwart Merlin Crossingham and then most recently, an internal film) – so still to this day, new and fantastic opportunities arise and I grab them with both hands, it’s so exciting! And do you feel that the support the team at Aardman have given to your Jam Factory projects has helped you to cement your role at Aardman? Most definitely! The only thing I was unsure of, when I first joined Aardman, was what would happen to my love of side-projects, and the name I’d built for myself under the name of ‘JamFactory’ (Not that anyone knew what JamFactory was, but just for my own personal satisfaction of doing things myself). Luckily, I’ve been more productive than ever with passion-projects because Aard’s actively encourages people’s passions. That comes right from the top too – co-founders Dave and Pete both are huge supports of pro-active people, and that means so much. It’s always super fun to discover what more your co-workers do outside of their 9-5, and that in turn fuels what happens and what’s possible within that 9-5. It’s really a virtuous circle and I’m so fortunate to be a part of that. I love it! Moving on to your side projects, for those who aren’t aware of the sheer massive number of projects you do, could you please do a quick list of some of the ones you work on? Haha, I do love me a passion project! It comes from the fact that I’m excited by everything, inspired constantly by my peers and heroes, and by life itself! Ok, here’s a bit of a roll call on current side projects. I have shelves just above my computer and I stick index cards on there, in order, so I can track my projects. I *just* finished a huge side-project, my biggest yet, but I can’t say anything about it, I’m just waiting on a release. Needless to that that’s been an amazing experience – I was producer, animator, designer & director – it’s been great jumping from role to role with that, I can’t wait to share what it is! 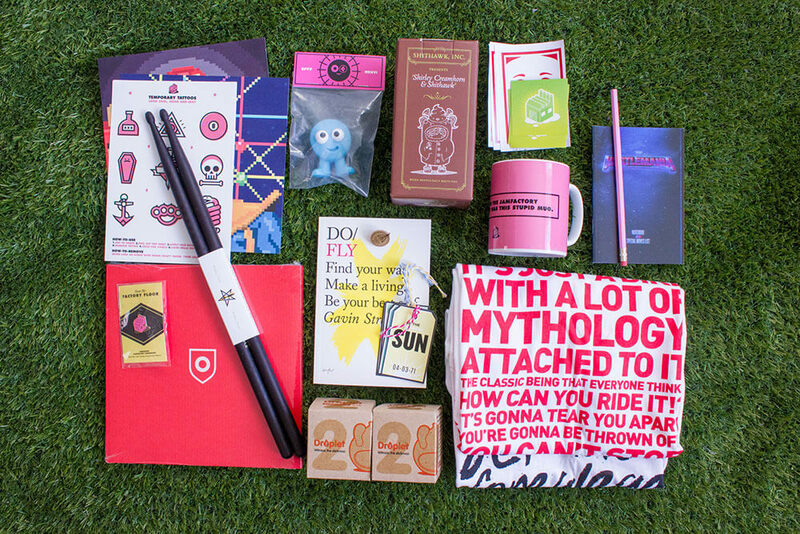 Oh and I now write a fortnightly column for design website Inkygoodness! You are probably one of the busiest people we’ve ever met! With working full time and having so many side projects going on, do you have any tips on how to manage the workload? Ahhh thanks very much, I take that as a compliment! I love being busy! I think you just have to be super disciplined with your time. For example, I got up to do this interview at 6am. You just have to look at your 24 hours and decide what you want to spend your hours and your energy on. I tend to work through my lunch on passion projects or getting little tasks done. That doesn’t mean I’m a workaholic though (well… erm, maybe that’s not true) – but I still make the time to spend with my new family. So when I come home at night, that’s family time, and I love it. People say they don’t ‘have the time’ – but no one has the time, you have to make the time! You’ve made appearances on CBBC’s Art Ninja. How have you found the transition from working on roles behind the camera to one in front of the camera? Oh man, I love it, it’s so much fun! That came about, purely because my friend Ricky has had TV shows before, and when Art Ninja was in production, they wanted to get his real friends involved that were creative, so it felt natural. So that’s how we got involved! That was 3 series ago now and we’re still going strong! It’s great fun because we all get to act like total idiots and be silly. It’s also really inspiring to observe how a proper live-action tv crew operates, I’ve picked up so many tips and techniques just from observing those guys, which I apply to my own moving image work. In addition to all that, you run STRANGE with your wife Jane. Do you find some advantages to working with someone you have such a close relationship compared to working with a client? Yeah, It’s lovely with Jane and me making STRANGE together. Something that’s truly ours and can be whatever we want it to be, that’s a great feeling. We also push each other too, so we float different ideas by each other and that, in turn, always makes for a better end result. It’s tough though – trying to build a retail business is not all roses, and it continues to be a challenge for us, but in the best possible way. We’re learning at every turn. But sharing that challenge with your partner means you can share the responsibility, share the difficult bits but also share in the positives too! Our editor Callum has had (in his own words) “the ultimate pleasure of witnessing, in person, one of your conference talks”. Do you enjoy doing conference speaking and do you have any tips for anyone trying to get into conference speaking? Ahhhhhhh man, that’s too kind! Too too kind! Thank you! I really enjoy speaking at conferences. It’s funny, never in a million years did I think I’d ever so that, as I wasn’t always terribly confident speaking in front of people when I was younger, I just sorta fell into it with a stranger offering me a chance to talk about my work at an Apple Store in Birmingham, many moons ago – and it all went from there! Since then I’ve been fortunate enough to speak at some of the best festivals in the world, and meet lots of my heroes because of it, I love it! But, don’t be too self-deprecating. It took me years to learn this until a friend took me aside and told me to stop apologising on stage – get that balance between humility and confidence. It really took me a long time to learn that confidence doesn’t mean arrogance. Use what works for you. My style, as it turns out, is trying to talk as fast as I can and being as animated as possible, with loads of energy. That, however, won’t work for everyone. I wish I could give beautifully succinct advice on-stage, but I can’t, as that’s not me, so work with what you’ve got. You have recently launched your first book “DO Fly”, congratulations! Can you tell the readers a little bit more about this and where they can pick up a copy? It’s a dream come true to have written a book and to see it out there in the wild! In a nutshell, it’s a pocket-guide to finding and doing the work that you love. Realistic advice for helping you discover what your passions are, and making them into your career. It’s published by The Do Book Company, the publishing arm of the super inspirational DO Lectures. I had the huge honour of speaking there in 2014 (Al Gore and Tim Berns-Lee are previous speakers!!!) and came away so inspired. I also came away with a copy of ‘DO Purpose’ by founder David Hieatt, which I read cover to cover in one sitting. I was so hyped I flicked to the back of the book, found the contact email address, and emailed the company straight away to express my love of the book and how it made me think it might be possible for me to write something similar. Cutting a very long story short, my gamble worked and I worked together with Miranda, the founder of Do Book Company and my book came to life a few years later! You can get it direct from the Do Book Company, via my website, or at most big bookstores around the world, which is a bloomin’ awesome feeling! If today you could give yourself at 10 years old some advice, what would that be? You know what, if I could be a fly on the wall back in time, watching my 10-year-old self – I don’t think I’d say anything. I think you need to be weird, need to be confused, need to be unsure. I think your life’s journey, pretty much, is unravelling who you are and what you want to do. For me, that process didn’t even really begin until I was about 18. So I think those early formative years of being a silly kid are essential. The weirder the better really! 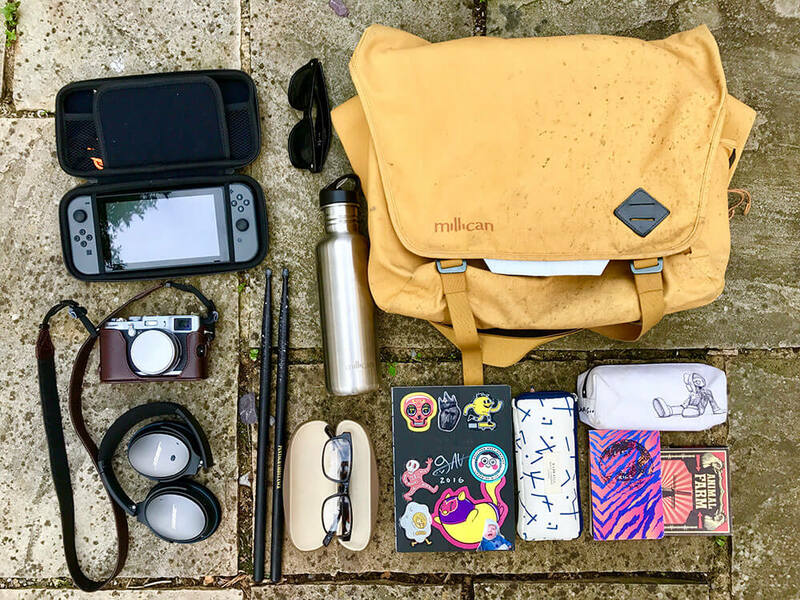 Finally, we have our infamous “What’s in your bag?” question where we get an insight into the equipment and tools you would carry around with you every day. So Gavin, what’s in your bag? Millican water bottle – Stay hydrated kids! Nintendo Switch – The best! Love having this with me for a cheeky 10mins of Mario Kart at lunch or a spot of Zelda whilst waiting in a queue for something! Drum sticks – I always have these in the bottom of my bag. I have a lesson each week and it’s also useful to be able to air drum at a moments notice!